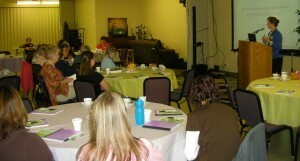 Wanda Cullison was the keynote speaker for the Heartland Women of Grace’s Day Away on Saturday. The Women of Grace in the Heartland District of Grace Brethren Churches held their Day Away Saturday, April17, at the Winona Lake (Ind.) Grace Brethren Church. Women came from across Indiana and Michigan to experience an “Expectant Encounter” with God. Keynote speaker, Wanda Cullison, spoke on various aspects of prayer. A panel discussion on prayer or spiritual journaling was led by BMH executive director Liz Cutler Gates and included tips on journaling from Beverly Melton, of the Winona Lake Grace Brethren Church, and Anasatasia Corbin, of Grace Community Church, a Grace Brethren Church in Goshen, Ind. Jerimiah and Marcy Olson, also from the Goshen church, led worship time.